A month ago, I was working on a series of blogs about the long-term impacts of and solutions for climate change. I got sidetracked and decided to follow two dramatic events as they unraveled: first was the tax legislation that has now been passed in different forms in both the House and Senate. It is predicted to increase the deficit by 1.5 trillion dollars in the next ten years. I also looked at the White House’s formal approval of a detailed, congressionally-mandated report about the impacts of climate change on the US. Given the details of the predicted damage that climate change can inflict, I believe that the two decisions were contradictory and that the lawmakers’ actions are irrational. Fusion power is a form of power generation in which energy is generated by using fusion reactions to produce heat for electricity generation. Fusion reactions fuse two lighter atomic nuclei to form a heavier nucleus, releasing energy. Devices designed to harness this energy are known as fusion reactors. The fusion reaction normally takes place in a plasma of deuterium and tritium heated to millions of degrees. In stars, gravity contains these fuels. Outside of a star, the most researched way to confine the plasma at these temperatures is to use magnetic fields. The major challenge in realising fusion power is to engineer a system that can confine the plasma long enough at high enough temperature and density. As a source of power, nuclear fusion has several theoretical advantages over fission. These advantages include reduced radioactivity in operation and as waste, ample fuel supplies, and increased safety. However, controlled fusion has proven to be extremely difficult to produce in a practical and economical manner. Research into fusion reactors began in the 1940s, but as of 2017[update], no design has produced more fusion energy than the energy needed to initiate the reaction, meaning all existing designs have a negative energy balance. Over the years, fusion researchers have investigated various confinement concepts. The early emphasis was on three main systems: z-pinch, stellarator and magnetic mirror. The current leading designs are the tokamak and inertial confinement (ICF) by laser. Both designs are being built at very large scales, most notably the ITER tokamak in France, and the National Ignition Facility laser in the USA. Researchers are also studying other designs that may offer cheaper approaches. Among these alternatives there is increasing interest in magnetized target fusion and inertial electrostatic confinement. Stars are the energy generators of the universe. Per definition, they all generate their energy — through fusion in their cores. The most important source of this energy is hydrogen. All the hydrogen in the universe was created primordially in its first few minutes of formation (big bang). The initial distribution of elements was mostly 75% hydrogen and 25% helium. So cosmologically, hydrogen is the primary energy source in the universe. It can be converted into other forms of energy by way of fusion reactions. Stars in the universe are defined by their ability to utilize fusion reactions: the gravitational contractions raise their core temperatures above the ignition of the fusion reaction. Star masses are limited to between around 100 solar mass (the mass of our sun) to 0.1 solar mass. The upper limit comes because the “burning” of the hydrogen accelerates sharply with the mass of the star, thus making the lifetime of the big stars shorter as they grow, while the star masses’ lower limit is the minimum gravitational force strong enough to ignite fusion of simple hydrogen in their cores. Brown dwarfs are objects which have a size between that of a giant planet like Jupiter and that of a small star. In fact, most astronomers would classify any object with between 15 times the mass of Jupiter and 75 times the mass of Jupiter to be a brown dwarf. Given that range of masses, the object would not have been able to sustain the fusion of hydrogen like a regular star; thus, many scientists have dubbed brown dwarfs as “failed stars”. The ultimate solution to our energy problems is to learn how to use fusion as our source of energy. Since immediately after the Second World War, we have known how to use fusion in a destructive capacity (hydrogen bombs) and have been earnestly trying to learn how to use it for peaceful applications such as converting it into electrical power. It is difficult. To start with, if we want to imitate our sun we have to create temperatures on the order of 100 million degrees Celsius. Before we can do that, we have to learn how to create or find materials that can be stable at such temperatures: all the materials that we know of will completely decompose in those circumstances. Figure 1 illustrates the facilities engaging in this research and their progress. 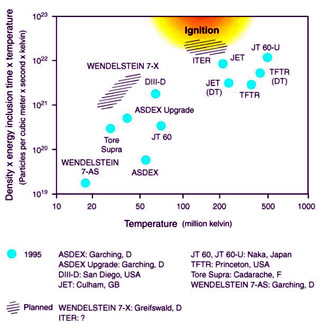 We are now closer than we have ever been to maintaining a positive balance between energy input and energy output (ignition in the graph) but we are not there yet. The triple product is a figure of merit used for fusion plasmas, closely related to the Lawson Criteria. It specifies that successful fusion will be achieved when the product of the three quantities – n, the particle density of a plasma, the confinement time,τ and the temperature, T – reaches a certain value. Above this value of the triple product, the fusion energy released exceeds the energy required to produce and confine the plasma. For deuterium-tritium fusion this value is about : nτT ≥ 5×1021 m-3 s KeV. JET has reached values of nτT of over 1021 m-3 s KeV. In other words, Joint European Torus (JET), which is located near Dorchester, England, is more than 1/5th of the way to figuring it out. The horizontal axis represents temperature in the Kelvin scale. John Holdren has heard the old joke a million times: fusion energy is 30 years away—and always will be. Despite the broken promises, Holdren, who early in his career worked as a physicist on fusion power, believes passionately that fusion research has been worth the billions spent over the past few decades—and that the work should continue. In December, Scientific American talked with Holdren, outgoing director of the federal Office of Science and Technology Policy, to discuss the Obama administration’s science legacy. An edited excerpt of his thoughts on the U.S.’s energy investments follows. Scientific American: Have we been investing enough in research on energy technologies? John Holdren: I think that we should be spending in the range of three to four times as much on energy research and development overall as we’ve been spending. Every major study of energy R&D in relation to the magnitude of the challenges, the size of the opportunities and the important possibilities that we’re not pursuing for lack of money concludes that we should be spending much more. I’m counting what the national labs are doing in the federal government’s effort. We just need to be doing more—and that’s true right across the board. We need to be doing more on advanced biofuels. We need to be doing more on carbon capture and sequestration. We need to be doing more on advanced nuclear technologies. We need to be doing more on fusion, for heaven’s sake. Hasn’t fusion been 30 years away for the past 30 years? It’s actually worse than that. I started working on fusion in 1966. I did my master’s thesis at M.I.T. in plasma physics, and at that time people thought we’d have fusion by 1980. It was only 14 years away. By 1980 it was 20 years away. By 2000 it was 35 years away. But if you look at the pace of progress in fusion over most of that period, it’s been faster than Moore’s law in terms of the performance of the devices—and it would be nice to have a cleaner, safer, less proliferation-prone version of nuclear energy than fission. My position is not that we know fusion will emerge as an attractive energy source by 2050 or 2075 but that it’s worth putting some money on the bet because we don’t have all that many essentially inexhaustible energy options. There are the renewables. There are efficient breeder reactors, which have many rather unattractive characteristics in terms of requiring what amounts to a plutonium economy—at least with current technology—and trafficking in large quantities of weapon-usable materials. The other thing that’s kind of an interesting side note is if we ever are going to go to the stars, the only propulsion that’s going to get us there is fusion. Are we talking warp drive? No, I’m talking about going to the stars at some substantial fraction of the speed of light. When will we know if fusion is going to work? The reason we should stick with ITER [a fusion project based in France] is that it is the only current hope for producing a burning plasma, and until we can understand and master the physics of a burning plasma—a plasma that is generating enough fusion energy to sustain its temperature and density—we will not know whether fusion can ever be managed as a practical energy source, either for terrestrial power generation or for space propulsion. I’m fine with taking a hard look at fusion every five years and deciding whether it’s still worth a candle, but for the time being I think it is. We know now that we can satisfy most of our needs and avert some of the predicted disaster if we use sustainable sources of electricity. If we can figure it out, fusion seems to be a good bet to solidify that trend. Micha Tomkiewicz, Ph.D., is a professor of physics in the Department of Physics, Brooklyn College, the City University of New York. He is also a professor of physics and chemistry in the School for Graduate Studies of the City University of New York. In addition, he is the founding-director of the Environmental Studies Program at Brooklyn College as well as director of the Electrochemistry Institute at that same institution. This entry was posted in administration, Climate Change, politics, Sustainability, Trump and tagged Adaptation, brown dwarf, Clean Energy, Climate Change, Climate Change Deniers, Climate Skeptics, CO2 emissions, deficit, density, deuterium, Donald Trump, Electricity, Emissions, energy transition, failed star, fission, Fossil Fuels, fusion, Global Warming, greenhouse gas, helium, hydrogen, hydrogen bomb, ignition, isotope, ITER, JET, John Holdren, Kelvin scale, laser, lithium, magnetic mirror, Mitigation, National Ignition Facility, Nuclear, nuclear fusion, nuclear power, particle density, Physics, plasma, politics, Power, Power Plants, radioactive, renewable energy, Science, Solar, solar mass, Solution, star, stellarator, sun, Sustainability, Tax, Technology, tokamak, tritium, Trump, US, white house, wind power, z-pinch. Bookmark the permalink.